Send Gifts To Romania online gift store is delighted to offer you exotic fruits like kumquats that you can send to your loved ones in Romania! 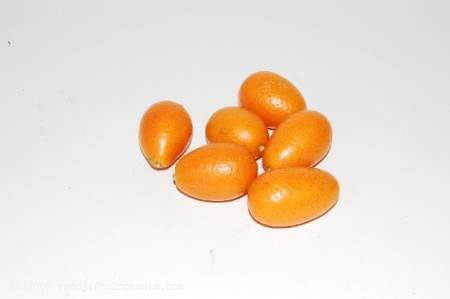 Kumquats are the fruis produced by small evergreen trees, also known as kumquats. Native to Asia (China and Indochina). Although delicious as fruits, they are also popular as ornamental plants because of their shiny leaves and delicate flowers. The most comon way to eat qumquat are: as a whole, fresh or to add it in fruit salads or deserts.